Obesity is a disease which leads to several chronic illnesses and reduces the life expectancy. It is a complex health problem, caused by a number of factors, such as excessive food intake, lack of physical activity, genetic predisposition, endocrine disorders, use of certain medications, and psychiatric illnesses. More recently a linkage between infection with Adenovirus 36 and obesity has also been investigated. Obesity has been identified as the leading preventable cause of mortality and morbidity, and substantial research has been conducted to identify the molecular targets for pharmacological interventions. Extensive studies on nutritional aspects and life style changes have also been carried out to prevent the on-set of obesity. Prevalence of obesity in both developing and developed world has reached to an epidemic proportion. In response to this, efforts to control and treat obesity have also been vigorously pursued, ranging from raising awareness about lifestyle modifications to the discovery and development of safe and effective anti-obesity drugs. 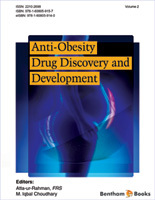 “Anti-obesity Drug Discovery and Development” focuses on this important area of healthcare research. The second volume of this eBook series is a compilation of five well written reviews on the state-of-the-art developments in obesity research. This volume begins with a review of Sabán-Ruíz et al. explaining the relationship between obesity and cardiometabolic syndrome. This comprehensive review covers basic research and epidemiology about obesity, metabolic syndrome and cardiac diseases, as well as old and new drugs used to treat obesity and hypertension. The problem with such drugs that were approved for prescription, was they are effective in the short-term but that they often exhibit several adverse side effects. These include newer drugs, such as sibutramine, rimonabant and orlistart. This has been an ongoing concern in anti-obesity drug development. The researchers have also mentioned progress in the new drug development and combined therapies in clinical trials. The chapter concludes with a discussion of anti-obesity therapy using Topiramate, a drug used to treat psychological disorders and the implications of such drugs for the treatment of cardiovascular disorders. Obesity is also be regarded as a consequence of homeostatic imbalance within the body. Homeostatic balance is influenced by hormone levels, food intake, epigenetics, immunological factors, and others. Suba, in chapter 2, explores the hypothesis of estrogen as an anti-obesity agent. The author suggests that estrogen has positive regulatory effects on the lipid distribution in the body as well as resistance to insulin. Research also suggests that insulin helps to promote pancreatic insulin secretion and controls the inflammatory response of adipocytes. Hormonal therapy, such as estrogen administration to patients – postmenopausal women in particular – has shown positive outcomes with respect to curbing fat deposition in the body. In chapter 3, Essam Abdel-Sattar and colleagues have reviewed the scientific works on herbal and microbial remedies of obesity. This review presents the mechanisms of action of active ingredients and contains a comprehensive list of herbs that can be used to treat obesity and associated disorders. The authors have also included illustrations of some of these herbs, many of which could be used to develop effective nutritional supplements. Reyna and Banu have reviewed the work conducted on the capacity of natural extracts which can be used to interface with lipid metabolism. Natural products can provide a safe and cost effective OTC solution for the treatment of obesity. This review focuses on several types of plant extracts and also discusses some benefits of common dietary herbs, such as tea, lotus and certain oriental and eastern spices. The review also provides information about the anti-obesity mechanism of action of selected natural products. Babenko has contributed a lucidly written review on the possibility of targeting sphingolipids metabolism in the quest for controlling obesity. Specifically, this can be achieved by targeting sphingomyelin hydrolysis and nucleotide synthesis pathways to limit the ceramide production in cells. Since an increased ceramide levels in obesity patients has been observed, it is believed that reducing the concentration of ceramides, by inhibiting the enzymes involve in its biosynthesis, can help in tackling the disease. The author discusses the results of inhibition of sphingolipids in mice as a first step towards drug development. At the end we would like to express our deep gratitude to all the contributors for making this volume an excellent compilation of state-of-the-art knowledge on the molecular basis of obesity and its effective treatment. We also wish to express our thanks to Ms. Maria Baig (Manager Publications) and other members of the Bentham Science Publishers for their efforts in the timely completion of this volume. We are also most grateful to Mr. Mahmood Alam (Managing Director) for efficiently leading the Bentham team in this project.